Peyton is a stout powerful son of one of our best dogs, Merganser's Ferris Bueller MH, WC. The dam side of Peyton's pedigree goes back to one of the more famous dogs that we have produced, Merganser's Classic Rip-N-Tear MH. Peyton has a stocky build, broad head, and otter tail. He weighs 92#. Peyton came to us at age 2 very well socialized but with minimal obedience and no retrieving experience. 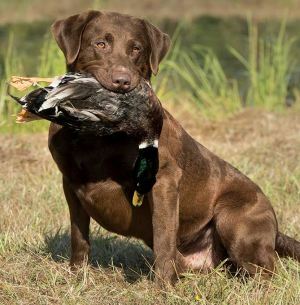 Dianne channeled Peyton's energy with gun dog training. Peyton now lives to retrieve. Peyton gets along with adults, children, other dogs, and cats. He is a mellow dog in our house. Peyton has an International Show Champion title, a Junior Hunter title and a Working Retriever Excellent Certificate. Peyton was sold to Jarret and Trina Wideman, Alberta Labradors in December of 2015.